As always I have been doing a lot of reading and of course that has led me to do some more revisions to my Civil War and Gettysburg text. I re-wrote the introduction to the first chapter in order to talk about the nature and role of history in understanding who we are as a people today. The section is part of a chapter that is now over 150 pages long and probably will become a book in its own right. Of course this section, and the rest of the chapter will likely be worked on some more in the coming months but I think that you will like it. Richard Evans wrote something in the preface to his book The Third Reich in History and Memory that those who study military history often forget. He noted: “Military history, as this volume shows, can be illuminating in itself, but also needs to be situated in a larger economic and cultural context. Wherever we look, at decision making at the top, or at the inventiveness and enterprise of second rank figures, wider contextual factors remained vital.”  Thus while this work is an examination of the Gettysburg campaign it is important to understand the various issues that were formative for the men who directed and fought the battle, as well as the vast continuum of often distant and seemingly events that come together at one time in the lives of the participants in any historic event. One cannot understand the determination the determination of Robert E. Lee to maintain the offensive, the dogged persistence of Joshua Chamberlain or Strong Vincent to hold Little Round Top, what brought John Buford to McPherson’s Ridge, what motivated Daniel Sickles to move Third Corps to the Peach Orchard, and what motivated the men of Pickett’s division to advance to their death on Cemetery Ridge, without understanding the broader perspective of history, as well as how culture, politics, economics, religion, sociology, ideology, experience, and that shaped these men and their actions. Likewise in order to understand the context of this battle, or for that matter any battle in any war, one has to understand the events, ever distant events which play a role in the battle. All too often those that delve into military history, or a particular battle see that as separate event, often disconnected from other historical events. But as historian Edward Steers Jr. correctly notes, history “does not exist in a series of isolated events like so many sound bites in a newscast. It is a continuum of seemingly unrelated and distant events that so often come together in one momentous collision of time.”  In the case of Gettysburg events like Lincoln’s publication of the Emancipation Proclamation, the failure of Confederate diplomacy to bring France or Great Britain into the war or at least to recognize the Confederacy, the failures of the Confederate armies in the West to maintain their hold on the Mississippi River, all play a crucial role in Robert E. Lee’s ill-advised decision to launch an invasion of Pennsylvania. Additionally, the loss of so many key leaders in the Army of Northern Virginia, especially that of Stonewall Jackson impacts how Lee manages the campaign, and shows up at numerous crucial points in the battle. 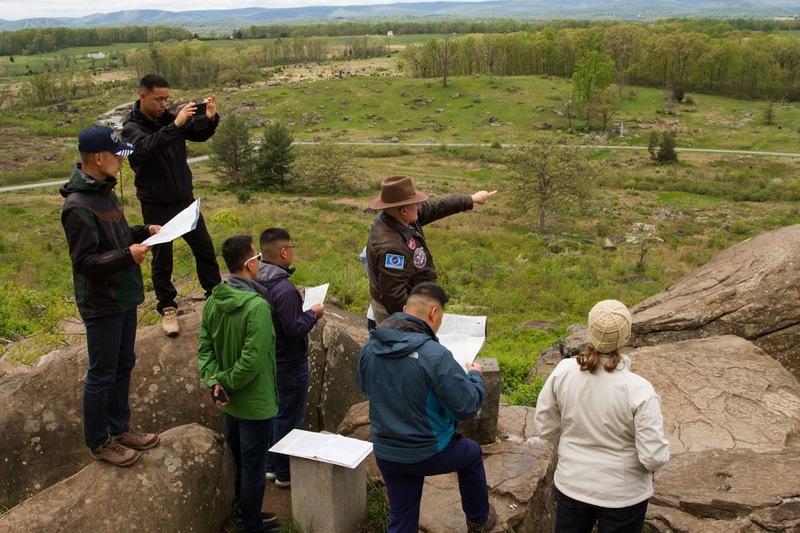 Another element that must be connected in order to understand the Battle of Gettysburg is the part that policy, strategy, war aims and operational doctrine played in the campaign of 1863 and how those influenced the decisions of participants before, during and after the campaign. Finally, the Battle of Gettysburg cannot be looked at as a stand-alone event. What happens there as the Confederacy surges to and ebbs back from its “high water mark” influences the rest of the While the war would go on for nearly two more years, the Union victory at Gettysburg coupled with the victory of Grant at Vicksburg ensured that the Confederacy, no matter how hard it tried would not be able to gain its independence through military means. The Battle of Gettysburg itself is enshrined in American history and myth and is woven deeply into the story of the nation. In this narrative the Battle of Gettysburg is often different ways; in the North viewed as a victory that brings an end to the institution of slavery, and freedom for enslaved African Americans, and preserves the Union. In the South it is often part of the myth of the Noble Confederacy and the Lost Cause where the South was defeated by the Northern superiority in men and war making ability. The prolific American military historian Russel Weigley wrote of how the war, and in particular how the Battle of Gettysburg changed the American Republic. Thus it is important for Americans to learn about the Battle of Gettysburg and the American Civil War, but not solely for its military significance, nor for clear cut answers or solutions. The fact is that “situations in history may resemble contemporary ones, but they are never exactly alike, and it is a foolish person who tries blindly to approach a purely historical solution to a contemporary problem. Wars resemble each other more than they resemble other human activities, but similarities can be exaggerated.”  As Michael Howard warned, “the differences brought about between one war and another by social or technological changes are immense, and an unintelligent study of military history which does not take into account these changes may quite easily be more dangerous than no study at all. Like the statesman, the soldier has to steer between the dangers of repeating the errors of the past because his is ignorant that they have been made, and of remaining bound by theories deduced from past history although changes in conditions have rendered these theories obsolete.”  The ideal that we reach for is to understand the Battle of Gettysburg and the American Civil War in context, which includes understanding what led to the war as well as the period of Reconstruction, and the post-Reconstruction era. In doing so we attempt to draw lessons from it without making the mistake of assuming that what we learn and know about them is immutable and thus not subject to change, for the past influences the present, even as the present and future will influence how we view and interpret the past.